Her malady—nightmares that left her bloody—seemed, at first, to be a common self-harm complex. Then I looked at the wounds. The mind is powerful, but I have never seen the mind create wounds like these. Little did I know her wounds were just the first of many mysteries I would face while caring for Josephine. Not all patients can be cured—or want to be. Psychologist Carolyn Fern’s newest patient suffers from nightmares that leave glyph-shaped wounds across her skin. The case is odd, even for an institution like Arkham Sanatorium, where the unusual becomes the everyday. Things become even more complicated after the young woman claims to have met Malachi—Carolyn’s former patient whose treatment was cut short when he was brutally murdered—in her dreams. What is the link between the two, and how can Carolyn help a patient who, it seems, does not wish to be cured? 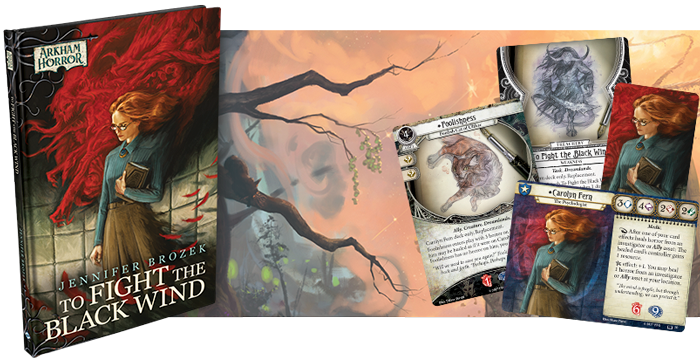 Fantasy Flight Games is proud to announce the upcoming release of To Fight the Black Wind, a new novella by Jennifer Brozek set in the Arkham Horror Files universe and containing four exclusive cards for Arkham Horror: The Card Game, available for pre-order at your local retailer or online through our website here! To Fight the Black Wind takes you to the halls of Arkham Sanatorium, where visiting psychologist Carolyn Fern is trying to understand her new patient, Miss Josephine Ruggles. The young heiress has come to the asylum of her own volition, seeking help with her nightmares. These haunting dreams leave her back torn and bloodied, with weeping wounds that appear to be written in some strange language at once alien and familiar. Stranger still, the marks pucker as if they were pushed out of her rather than scratched in. After researching possible solutions at Miskatonic University’s Orne Library, Carolyn attempts hypnotherapy to help her patient face her nightmares. But as she tries to draw the young woman out of her madness, the psychologist finds herself transported to the Dreamlands, where the rules of the waking world do not apply. The place is curious, dangerous, and all too real. In the surrealistic landscape, Carolyn learns that our world is but one plane, one facet that makes up the whole of existence. Here, Elder and Outer Gods battle for dominance and her patient is inextricably linked to one of the maddening entities. Both Josephine and the Dreamlands are in grave danger, but how can a doctor protect her patient from entities that mortals were never meant to understand? 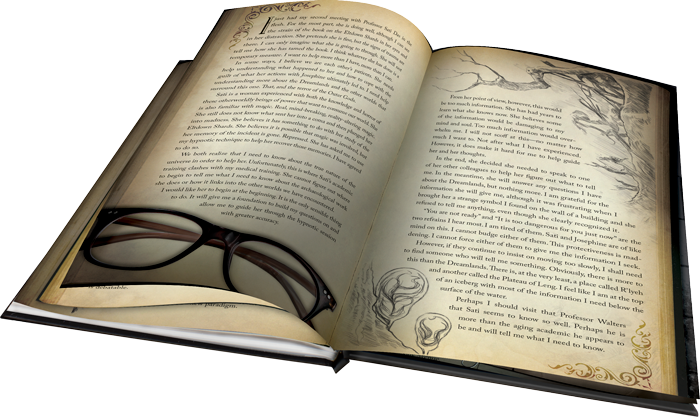 In addition to the story itself, To Fight the Black Wind includes fifteen pages of full color inserts. These primary sources provide you with newspaper clippings and Carolyn Fern’s personal journal, recording her encounters in the Dreamlands and her progress with the case to draw you further into the investigation and immerse you in the Arkham Horror Files universe. Only by closely studying the evidence will you be able to survive the journey through the Dreamlands and guard Josephine against the dangers that reside there. 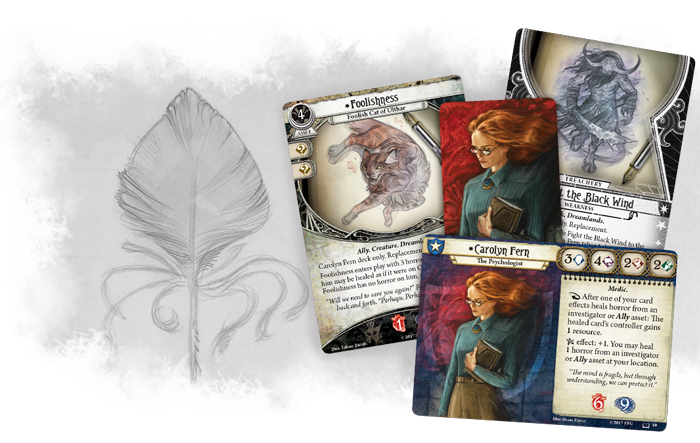 Once you accompany Carolyn Fern on her quest to save Miss Josephine Ruggles, she may choose to help you in the future and join your team of investigators in Arkham Horror: The Card Game. This is her first introduction to the game, though she will also appear in a future expansion for the game. Carolyn Fern is a woman of learning, but as a doctor, her true mission and desire is to protect the patients in her care, making her part of the Guardian class. However, she is still driven by her wish to understand the Mythos as the world is widened and its mysteries are laid before her, enabling her to include either Seeker or Mystic cards in her Investigator deck. Carolyn will prove a valuable addition to your investigators as your adventures bring you in close contact with maddening creatures and vengeful gods from beyond the reaches of our world. In fact, the psychologist can use her contacts within the medical community to earn funding for proven success in her field. 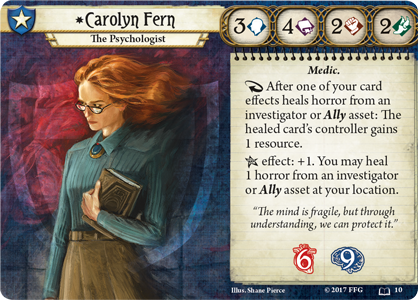 After one of Carolyn’s card effects heals horror from an investigator or Ally, the healed card’s owner gains a resource. Beyond this, the good doctor will gladly assist anyone she can during an investigation. If Carolyn strikes luck and draws an Elder Sign token from the chaos bag, she may heal one horror from an investigator or Ally in her location. The mind may be fragile, but through understanding, it can be protected. In the mysterious Dreamlands, you will encounter a menagerie of strange creatures, both fair and foul. Here, all are as they should be and are named for their identities, not their masks. In Ulthar, where no man may kill a cat, you will find the feline Foolishness (To Fight the Black Wind, 11). Foolishness enters play with three horror on him, which can be healed as if it were on Carolyn Fern. 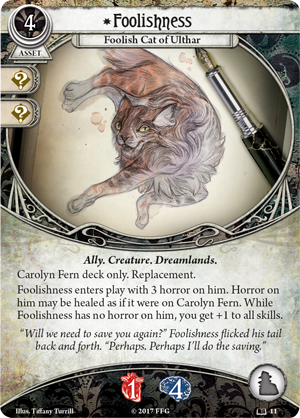 While Foolishness has no horror on him, all of Carolyn's skills are increased. The cat may need to be protected from his own nature, but his loyal heart and knowledge of the Dreamlands make him a powerful friend. For all its beauties, the Dreamlands also holds great danger for those who visit there, threatening their sanity. 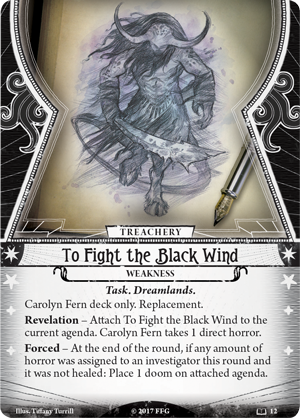 Carolyn’s personal treachery card, To Fight the Black Wind (To Fight the Black Wind, 12), forces the psychologist to become personally responsible for the mental health of all her companions. When this Task is revealed, it is attached to the current agenda and Carolyn Fern immediately suffers one horror, knowing that she has brought this terror on her fellow investigators. At the end of the round, if any amount of horror was assigned to an investigator and it is not healed, one doom must be placed on the attached agenda. Carolyn Fern is a master in her field, but this duty is more than any one person should have to bear. One thing is certain, Carolyn Fern will do anything within her power to ensure that those who rely upon her remain safe and sane. Ready your mind for a maddening journey into a realm you know, but only in your dreams. Confront the dangers of the Dreamlands and help Carolyn Fern find what it takes To Fight the Black Wind! Pre-order To Fight the Black Wind (NAH14) at your local retailer today or on the Fantasy Flight Games website here! The copyrightable portions of: Ghouls of the Miskatonic are © 2010 Fantasy Flight Publishing, Inc.; Dance of the Damned are © 2011 Fantasy Flight Publishing, Inc.; Bones of the Yopasi and Lies of Solace are © 2012 Fantasy Flight Publishing, Inc.; Feeders from Within and Dweller in the Deep are © 2013 Fantasy Flight Publishing, Inc. The Hungering God are © 2014 Fantasy Flight Publishing, Inc.; Arkham Horror is a registered trademark of Fantasy Flight Publishing, Inc.